If It's Too Loud...: Guerilla Toss - "Doll Face on the Calico Highway"
From the few songs that Guerilla Toss have released so far, Eraser Stargazer is going to be a total departure for the band. Not that they're going to be releasing an album of alt-country ballads, but this album is just different. 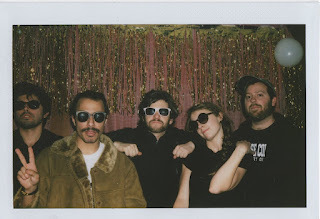 "Doll Face on the Calico Highway" is a pretty intense song by other bands' standards, but for Guerilla Toss it's almost like a Bon Jovi ballad. The song is a slightly slower than mid-tempo spoken word plodder. The band seems to be shedding the attention grabbing shriek of noise punk, and are instead moving towards the aggravation of art rock. It will still get you weird looks from the others in your work cubicle farm, but maybe they'll ask you what it is instead of just demanding you turn it off. Eraser Stargazer is due out on March 4 on DFA Records. You can get more information on Guerilla Toss via their Bandcamp and Facebook. Watch the lyric video for "Doll Face on the Calico Highway" below.